The Jellyfish Eyes project began over ten years ago as a full cg animated film but after many twists and turns, it was put on the shelf. It was only after meeting Yoshihiro Nishimura of Nishimura Eizou that it was reborn as a live action feature. 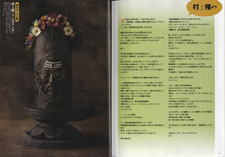 I met Mr. Nishimura while I was working on a series of column visuals for the Art Magazine Geijutsu Shincho. With the help of my old friend, the stylist Kazuki Yunoki, the series involved my creating a visual response to columns written by the art historian Nobuo Tsuji, each of which focused on a specific theme. 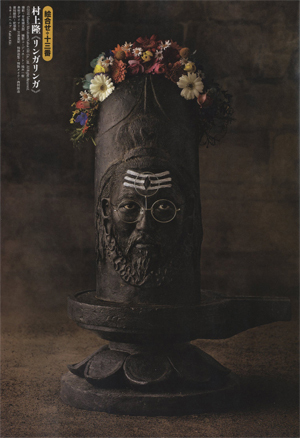 Mr. Nishimura become involved when we were called upon to reproduce an Indian Lingam sculpture.. Mr. Yunoki introduced me to him as a special effects make up artist. He was so clingy (I don’t meant this in a bad way!) that the next day, I called up Yunoki and told him what had happened. “Nishimura is a great guy!” he told me, completely cutting through my concerns. And that settled it. I called up Nishimura and asked him if his company had ever produced a film. That was early December, 2010. Since then, we’ve added new members. Mr. Nishimura introduced me to screenwriter Jun Tsugita, producer Mana Fukui, visual effects supervisor Tsuyoshi Kazuno, and others, moving the plan forward without rest, even in the midst of the disaster in March. As of this writing, we haven’t yet begun shooting, but I wanted to share with everyone the story of how I and the Kaikai Kiki staff met those involved with the film. 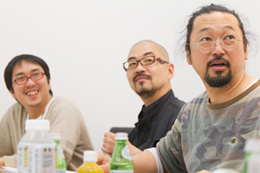 What we present to you now is the result of the strange accident of fate that brought myself and Mr. Nishimura together but that only leads me to believe that Jellyfish Eyes will be a very special film. These sorts of encounters are one of life’s treasures. That is why we have no choice but to join hands and weave a single message together. This is the sort of film that I want to share with all of you reading this. We will put our faith in the belief that this passion will come across and labor to bring our work to life. As the person on this set with the least knowledge and experience of film production, I know that I should refrain from saying these sorts of things, but I desperately wanted to share and record my first impressions and here we are.